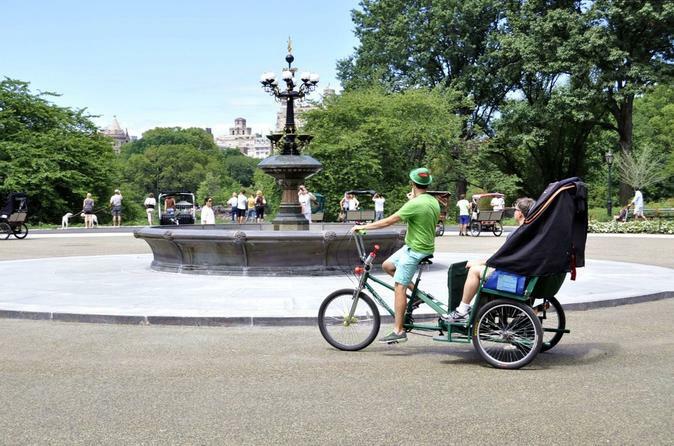 Uncover magical Central Park during a private 1 or 2-hours pedicab tour. Visit popular sites including Strawberry Fields, Bethesda Fountain and Bow Bridge, as well as the filming locations of over 350 movies. If choosing to do the 2-hour tour you’ll also get to see the Onassis Reservoir, Alice in Wonderland, Swedish Cottage. This private tour offers a more personalized experience. After meeting up with a friendly guide/driver, hop in a traditional pedicab and enjoy a tour of one of New York City’s most famous destinations, Central Park. Chose from a 1 or 2-hour tour, both of which will encompass some of the park’s most popular sites. In the 1-hour tour pay a visit to Strawberry Fields, the Bethesda Fountain and Terrace, Bow Bridge, Tavern on the Green, The Literary Walk, The Plaza Hotel, Sheep’s Meadow and Balto, plus the gorgeous Dakota Building and The Henry Frick Mansion. If on the 2-hour tour, visit all the same sites as well as the Onassis Reservoir, Alice in Wonderland, Swedish Cottage. Both options provide the opportunity to see famous locations and under-the-radar finds while learning about the history of the famous park from a friendly, knowledgeable guide.